Fluidity is a funny little puzzle game that sports a puddle of water as its main protagonist; however, you don’t get to control the water by any conventional means. Instead, the game sports a movement mechanic very similar to those ball-in-a-maze puzzles you used to play with as a kid. In order to move the water from one point to another, you must tilt the entire level. This simple design feature makes for a puzzle game that is incredibly fresh and genuinely satisfying to play. The story is centered upon a magical book called the Aquaticus, which has become corrupted by some black sludge called the Influence (not to be confused with the jazz guitar album by Jimmy Raney). It’s up to you to use the Aquaticus’ remaining clean water to clear out this gook from its four chapters and restore the old tome to its former power. Each stage takes place in a page of the Aquaticus. You rotate the level by holding your controller horizontally and then tilting it to the left or right. Your goal for each chapter is to seek out Rainbow Drops by moving across hazardous terrain or solving physics-based puzzles. For example, you might be tasked with transporting two helpless goldfish into an empty fishbowl that just happens to be located on an island that’s separated from you by a pit of acid and some rotating platforms. For a downloadable game, Fluidity sports some really impressive water physics and this is where it derives all of its challenge. During these puzzles, the game forces you to keep control of the large pool of water as it pours and spills. Spread the water out too thin and it will begin to evaporate. Lose too much and you’ll lose a life. As this is a WiiWare game, there’s a great deal of emphasis on motion control without those pesky button inputs getting in the way. Now, while the motion controller design proves to be the game’s major strength, it is also the game’s biggest source of needless frustration. 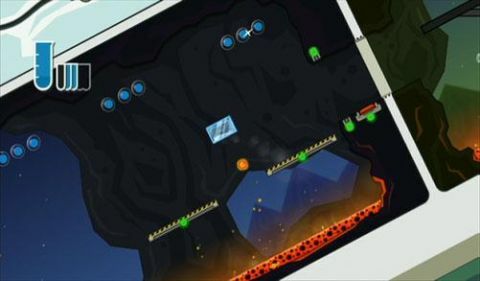 The tilt mechanics are near perfect; however, certain puzzles require that you make your puddle of water or block of ice jump by flicking the Wiimote up in the air. This works about 90% of the time. While four chapters may not seem like much, they are all stuffed with a ton of things for you to do and plenty of areas to explore. The chapters of Fluidity all sport Metroid-esque designs in that you won’t be able to access certain areas until you gain certain water forms (block of ice, cloud, etc). Likewise, collecting Rainbow Drops isn’t the only thing you can do. Collecting golden puzzle pieces unlocks special-challenge bonus stages for you to mess around in. Fluidity is a game that’s just plain fun. The puzzles aren’t too difficult and absolutely gratifying to solve. Just as well, the storybook approach paints a very pretty picture with brightly colored levels and relatively simple design. This game is well worth the $12 price tag. Fluidity is a cheap, fun puzzle game that belongs in your WiiWare library.